Nominations are now open for the 12th Annual Early Educator of the Year Awards. 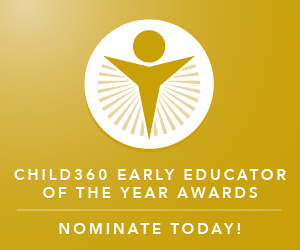 Each Spring, Child360 honors educators throughout Los Angeles that inspire our youngest learners, helping to shape their future. If you know of an outstanding educator that serves children from birth to five, or if that someone is you, Child360 would love to hear from you. Nominate or apply by May 1, 2019. Winners will be honored at a luncheon ceremony and will receive a monetary award through the Elizabeth Lowe / Bob Weekley Award for Excellence in Preschool Teaching endowment. Child360 is a nonprofit working toward a future where every child has the educational opportunities they need to succeed in school and life. This means supporting the development of the whole child, beginning at birth. Alongside trusted community partners, Child360 improves the quality of early learning and elevates the early learning industry through program support, professional development, advocacy, research, and community engagement. From every angle, Child360 is equipping the next generation, empowering them to discover their potential, and advancing the future workforce.